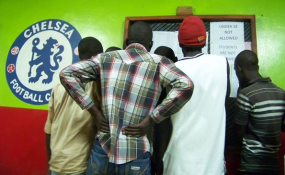 Youth look at football fixtures at a sports betting centre in Arua District recently. Several students in Nebbi District have resorted to sports betting. Kampala — Uganda could lose up to Shs50b in revenue annually if government if it bans sports betting in the country. Mr David Bahati, the State Minister of Planning, on Sunday announced that President Museveni had ordered government not to register new sports betting companies or renew licences for the existing companies upon expiry. Speaking to this newspaper last evening, Mr Bahati said the government will determine the number of betting companies and where they will operate in a new regulatory regime. "The President's directive is that we do not issue licences to new companies and we should not renew licences of those that expire, with the aim of strengthening the regulatory framework," he said last evening. "What we are doing is to review the betting sector with the view to regulate the number of betting companies because there are complaints that they are mushrooming everywhere. For example we will determine how many to licence and where they should operate across the country in order to strengthen the monitoring and protect youth from the effects of betting," Mr Bahati added. The minister, who said the monitoring would also stretch to online sites, did not give the time frame in which the new regulations would be implemented but that "sooner than later the ongoing review team will issue a statement on the procedures." Figures released by the National Gaming Board last year indicate that in 2016/17 financial year, government earned Shs37b from sports betting companies. At the time, Mr Edgar Agaba, the chief executive officer of the National Gaming Board, said the projection for 2017/18 was at Shs42b, and Shs45b for 2018/19 financial year. He said Uganda would earn up to Shs50b in 2019/20 financial year. Information from the Gaming Board indicates that government issued licences to 40 general betting companies, 20 casinos, 15 slot machines and one pool betting facility last year. Mr Albert Baine, a tax expert from Global Taxation Services Ltd, said government needs to strike a balance between the financial loss and the social impact of sports betting it intends to achieve or prevent. "If it is about taxes, then they have to look at the data, say for the last two years and see how much they have been earning and what will be the cost of losing the revenue. They have to come with a solution that is fair and balanced so that as a country we don't lose out. But also the bad impacts of betting are not spread across all youth of the country," he said. Mr Baine also said government needs to get its priorities right and look for ways of expanding the tax base before banning sports betting. Mr Paul Lakuma, a researcher at the Economic Policy Research Centre, said the decision to ban sports betting is welcome, but must be implemented in a well thought-out manner. He said although the ban is still speculative because government has not made a specific policy to implement it, if the betting is well regulated it will eliminate the vices of gambling among the underage and the poor. "It is a good move because a lot of unemployed youth have been using it as a means of employment. They should look for a way of regulating betting to prevent gambling, but that must be well planned because banning it will be like pushing it underground, which may bring more problems," Mr Lakuma said. "Sending the betting activities underground will bring in more problems like prostitution, money laundering, drug abuse and terror financing," he added. Mr Lakuma also said government should gazette areas for betting to avoid cases where all urban areas are littered with betting centres. Religious leaders have been at the forefront of condemning betting and gambling which they said is a breeding ground for crime in the country. Many criminals are suspected to be using betting centres for resting and reconnaissance of their targets during the days while at night they go for robbing. Betting companies remained guarded on the impending ban on gambling activities in the country, saying they had not received any communication from government about the President's directive. Several betting companies Daily Monitor contacted for a comment on the ban were all tight-lipped. They said they will only give their official positions after getting communication from government. A lady at Betway Uganda, who only identified herself as Agnes, said the company would get back to us, but by press time, the company had not responded. A source at Betin Uganda, who preferred anonymity, said: "We are waiting for government to write officially to us before commenting." Mr Agaba too said he was yet to receive government directive from the Finance ministry. "Please talk to the minister because I have not received any instructions from the ministry, so I cannot give you a response," Mr Agaba said. According to the Gaming and Lotteries Regulations 2017, government issues licences to gaming facilities. The law says the premises proposed to be used for such activities by the applicant shall be situated within a city, municipality or town; be away from a school, a hospital, a market, a place of worship or government offices and shall have a notice board placed in a conspicuous place for the display of licences, government notices, the rules of games promoted, telephone numbers of the Board, disclaimers regarding the effects of gambling and any other matter required to be displayed. -The most popular gambling activity is sports betting with close to 20 per cent of the respondents having betted on sports. - The majority of Kampala residents (73.3 per cent) engage in gambling as a source of livelihood as opposed to leisure. -Those who are working are more likely to be participants in the gambling industry compared to their Non-working counterparts. Moreso, there is higher probability of gambling participation among the males in comparison to females. -Prevalence of underage gambling: More than a third (39 per cent) of all respondents affirmed awareness of underage gambling. This finding points to loop holes in the country's current regulatory framework. Although there are regulations to guard against under age gambling, in practice such laws are rarely implemented or are willfully ignored by the owners of the gambling outlets. -Gambling negatively affects household welfare through displacement effects, dissaving and domestic violence: About 20 percent of gamblers reported a negative impact of gambling on household welfare. -Restrictions on gambling opportunities to those that can be effectively managed. Besides, over proliferation of gambling outlets stimulates demand that wouldn't otherwise have existed. -Safeguard minors from engaging in gambling activities through tighter laws and monitoring systems: The participation of young people (below 18 years of age) in gambling is increasingly becoming a matter of concern. -Bolster controls and supervision of the gambling industry: Parliament should prioritise and pass the current Lottery and Gaming Bill (2013) into law. -The government could also explore the idea of setting up special gambling zones outside the city which could attract significant investment in Uganda's gambling and tourism industry and boost tax collections. - There is need to strengthen capacity to track gambling businesses that are involved in tax avoidance and evasion.